From foundational learning to the practical application of skills, students converge from programming, robotics and engineering classes to contribute as team members in the school’s robotics club, Pyrobotics. Competing as part of an international program, FIRST® Robotics Competition, students with strengths and aptitudes in electrical engineering, mechanical engineering, pneumatics, programming, CAD design, and strategy analytics create a collaborative team experience. Pyrobotics competes with one to two teams in two divisions, FTC and FRC, against high school robotics programs in Minnesota at qualification events. 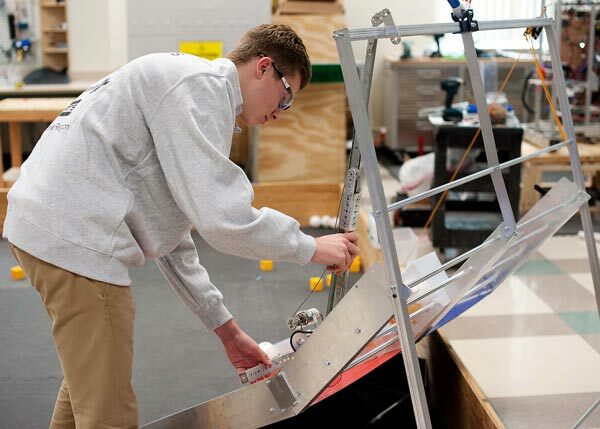 After moving on to the regional tournament, teams work to earn a spot at the national competition held in St. Louis each year. FTC is a class and meets every day in the fall and will compete in late November. The FRC team is a club which meets from January through April. With only a seven-week window from the introduction of the challenge to required completion date, club members work on the robot every day and most weekends. Our Pyrobotic teams have won multiple awards for innovation of design, presentation skills, and trips to regional and national competitions. Alumni of the program currently work as mechanical, electrical and computer software engineers for companies such as Amazon Robotics and Dolby Labs. Robotics Club and Curriculum is advised and taught by Mr. Nick Livermore. Mr. Livermore has a Bachelor of Science in Industrial Arts from William Penn University and Master of Arts in Educational Leadership from Crown College. Mr. Livermore joined the Holy Family faculty in 2005 and currently teaches architecture, computer applications, robotics, and engineering as well as a middle school pre-engineerng course.